Tre nye oljeselskaper har denne uken signert avtaler med Marokko for oljeleting i okkuperte Vest-Sahara. Støttekomiteen finner avtalene uetiske, politisk kontroversielle og sannsynligvis ulovlige. Det er første gang et selskap våger seg onshore, og leteaktiviteten skal skje midt i et av de mest militariserte områdene av Vest-Sahara. Det er en obskur liten samling av oljeselskaper som nå har fått lisenser for oljeleting i okkuperte Vest-Sahara. To av dem; San Leon (Morocco) Ltd og GB Oil and Gas Ventures Ltd er hittil uskrevne blad i den internasjonale oljebransjen. Det siste, Island Oil & Gas (bildet over), er et lite irsk selskap. Selskapet kom mandag 12. desember med denne pressemeldingen. 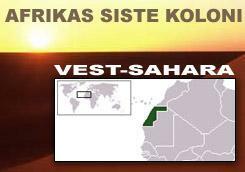 Selskapet kaller området marokkansk, til tross for at ingen stater i verden har anerkjent Vest-Sahara som en del av Marokko. Leteområdene ligger i et minebelagt område i den nordøstre delen av Vest-Sahara, like ved byen Smara. Støttekomiteen for Vest-Sahara, sammen med søsterorganisasjonene i Western Sahara Resource Watch, skrev i går et brev til det eneste av de tre selskapene hvor vi pr i dag har kontaktinfo; Island Oil & Gas. Støttekomiteen arbeider nå for å spore opp hvem som er bakmennene i de øvrige to selskapene. From a press release published on your homepages yesterday we have learned that Island Oil & Gas together with two other partners has signed a reconnaissance contract with the Moroccan state oil company ONHYM. The area you have signed an agreement for covers parts of the national territory of Western Sahara, occupied by Morocco. Western Sahara Resource Watch – an international network with member organisations in 30 countries- hereby wish to declare our strong denunciation of this agreement and wish to draw your attention to the very serious political and ethical implications of the agreement, as well as its undermining of Human Rights and International Law. Morocco is an illegal occupying power in Western Sahara. This has been established by The International Court of Justice in The Hague in 1975, numerous resolutions of The United Nations Security Council and General Assembly and by the UN Under-Secretary General of Legal Affairs, Mr. Hans Corell ( www.arso.org/ Olaeng.pdf) in his letter to the President of the Security Council on 29 January 2002. The occupation of Western Sahara has resulted in enormous suffering and deprivation of the Saharawi people, the rightful owners of the land and the natural resources of Western Sahara. Approximately 165.000 Saharawis are languishing in refugee camps in the inhospitable Algerian desert since 1975. The Saharawi population remaining in areas under Moroccan occupation is subjected to grave human rights violations, such as torture, forced disappearances and arbitrary detention. Most importantly, however, they have not been allowed to freely exercise their right to self-determination through a free, fair and transparent referendum. This right was established through UN General Assembly resolution 1514 (XV) (1960). Western Sahara Resource Watch is aware that your company has not consulted with the Saharawi people or their internationally recognized representatives; Front Polisario. It is therefore highly dubious that such a contract can be seen as being in accordance with international law, ref. the Corell opinion of 29 January 2002 . Island Oil & Gas is collaborating with an illegal occupier, thus increasing the risk of further armed conflict, destabilisation and suffering in the entire region. This increased tension actively undermines the hard work of the United Nations to solve the conflict in Western Sahara over the last fifteen years. Island's cooperation with the Moroccan government in the occupied area clearly lends legitimacy to the illegal Moroccan occupation of Western Sahara. This is made even clearer by Island's reference to the exploration area as "Moroccan" despite the fact that no country has recognised the territory as part of Morocco. Moreover, the zone in which your company has selected to carry out your operations is a highly militarised one. The acreage area is located just adjacent to the wall that the Moroccan forces constructed during the eighties, dividing the country into two parts. The area is believed to have one of the world's highest densities of landmines, and tens of thousands of Moroccan soldiers patrol the area. The licence also seems to cover areas in the vicinity of Smara, a town that has seen repeated clashes between Moroccan police and civilian Saharawis, as well as serious human rights abuses committed by Moroccan forces against the indigenous Saharawis. For the human rights violations in Smara, see for instance this summer's report by the human rights organisation Front Line ( www.frontlinedefend ers.org/news/ 2913 ), the report of the UN Secretary-General on the Situation Concerning Western Sahara, 12 April 2006 ( www.arso.org/ SGrep2006epdf) and the statement from Amnesty International, 3 April 2006 ( www.amnestyusa. org/news/ document. do?id=ENGMDE2900 72006). Over the last four years, our global movement has conducted international lobby campaigns vis-à-vis oil companies from several states that have been active offshore the occupied area. They include TGS-Nopec, Fugro NV, Thor Offshore, Total, Kerr-McGee, Wessex Exploration and Pioneer Natural Resources. The latest company to withdraw from the area, Kerr-McGee, was forced to listen to our arguments when its financial partners and the local political environment in the USA exerted pressure on them. As a consequence, the company lost shareholders for a total of US $80 million and eventually withdrew from its operations offshore Western Sahara in 2006. We also notice from your homepages that your company intends to pursue opportunities in third countries, such as Libya, the Netherlands and East Timor, all of them strongly in favour of self-determination for the Saharawi people. The latter, as you might now, was itself under foreign occupation for 24 years, and has extensive diplomatic relations with the Saharawi Arab Democratic Republic. We also know that you have several licences offshore Ireland, a country that has consistently pronounced itself in favour of the Saharawi people's legitimate claim to self-determination, lastly in the UN General Assembly this autumn. Western Sahara Resource Watch hereby appeals to Island Oil and Gas to demonstrate its attachment to International Legality and Human Rights by reconsidering its involvement in Western Sahara. We urge your company to make a public statement before the end of the year, making it clear that your company immediately withdraws from any commercial activity within the borders of Western Sahara in collaboration with the Moroccan government. With the present letter we hope to establish an open and frank dialogue with your company to address these concerns and we sincerely hope you will reciprocate. Western Sahara Resource Watch will be more than happy to provide you with any additional information that you may require to study this matter more closely. We also wish to request a meeting with your representatives in Dublin at the earliest convenience.